I have spoken at length about my love of the two Key visual novel based anime, Kanon and Clannad. Give me half a chance and I’ll talk your ear off about the subject, extolling their virtues and emotional impact long into the night. Listening to me prattle on about it, you’d think that Key and/or KyoAni has the lock on tear-jerking, soul-wrenching emotionally-charged romance stories. As it turns out, nothing could be farther from the truth. Perhaps this is the reason why my Anime Secret Santa picked ef – a tale of memories as one of my choices to review. And I am glad that they did. ef – a tale of memories is a 12-episode series animated by Shaft (they say that anime studio Shaft is a bad mutha – SHUT YO’ MOUTH!) and is based on the visual novel series ef – A Fairy Tale of the Two published by minori, which I honestly have never heard of before. (Then again I’m still a neophyte when it comes to visual novels.) It follows a cast of characters as they struggle through life and as their lives intertwine with each other. Hiro is an aspiring mangaka trying to juggle his work and school lives, and feels that his world is “missing a certain color.” Kei, his childhood friend, longs for Hiro’s affection but is unable to confront him with her feelings. Miyako, a cheerful, somewhat ditzy girl who Hiro runs into one evening, immediately becomes attached to Hiro, but underneath that cheerful exterior she is hiding some past sorrow. Kyosuke, a photographer and cameraman, seeks to capture true emotion in his work, but never feels like he has done this satisfactorily. Renji, a high school upperclassman, is faced with the decision of how he should go forward with his life; he has aspirations to become a novelist but is unsure of himself. Finally, there’s the quiet and mysterious Chihiro, who Renji encounters by chance one day; always cheerful if quiet, but who seems to be a different person every day. As the story progresses we see that these seemingly disconnected individuals’ stories do relate to each other. So how does ef – a tale of memories stack up against my beloved Key/KyoAni properties? Read on to find out! At first blush ef seems like an average romance as we follow a cast of characters as they struggle toward adulthood. And it doesn’t make a whole lot of sense at first, as it is actually several separate stories told simultaneously, and only later do we realize that the stories, and the characters, are all interrelated. But right off the bat the story grabs you and hits with a strong emotional impact as we begin to learn some of the characters’ tragic histories, and as the episodes unfold, the hits just keep on coming. There’s not a whole lot of wasted time or filler here, and the story has a near-perfect balance between action and introspection and character development. The characters are where this series really shines, especially the two lead characters Renji and Chihiro. You can relate to them, and you can’t help but sympathize with them when they encounter difficulty. They each have their flaws and their share of setbacks and sorrows, and as you watch them struggle to form a relationship, you want them to work things out and to get together. Chihiro’s backstory, in particular, really tugs at your heart strings. Miyako’s back story is almost as heartbreaking. Unfortunately, the other characters, while definitely likable and far from annoying, aren’t quite as strong. Hiro’s struggle to balance his school life with his budding career as a mangaka makes for a plausible motivation, but his wishy-washy attitude kind of irritated me; I’m not talking Shinji Ikari level here, but it was still annoying. Kei unfortunately does not have a chance to grow very far beyond the “just a childhood friend caught in a love triangle” cliche. This isn’t to say that she is weak; she’s definitely a strong character, just not particularly memorable. Kyosuke, the filmmaker, has a unique point of view which I really would like to see more of, but he serves mostly as a “second option” for Kei’s affections. 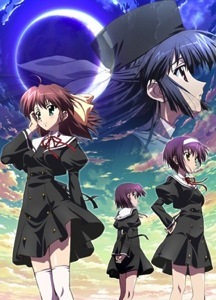 Finally, there’s the mysterious priest Yu Himura and the equally as mysterious Yuko Amamiya; there are definite hints that there’s more to these characters than meets the eye, but we don’t get to see much of that; they only serve to expound on the thoughts of the lead characters or to serve as counterpoint or chorus at critical moments in the plot. These multiple intertwining storyline type plots generally only work well when the varying storylines have more or less the same impact or interest level, and unfortunately this is the case here. The story of Renji and Chihiro definitely has the most emotional impact and dominates the series; the Kei, Hiro and Miyako stories are weak by comparison. Still, it is an enjoyable, emotionally charged story, and is well told, with excellent, if slightly confusing to some, pacing. Though those used to a more linear storyline may be confused, as the narrative frequently cuts between the different stories; just when you’re really getting into one of the storylines, the narrative suddenly jumps tracks onto a new storyline. But stick with it; it’s worth it. The animation is superb, with a vibrant color palette. Lighting, shadows and other visual effects are used to great effect, and the scenery is detailed and memorable. At the same time, the animators aren’t afraid to shake things up a little; often the animation turns to a more simple black and white style, or the colors get muted, or sometimes image masking is applied. A lot of scenes are very abstract and use a lot of symbolic imagery. All of these techniques give the show an avant-garde feel and really help to enhance the mood and emotion of the story. For example, during one character’s pivotal scene the screen goes completely white, with a small very lightly colored line drawing of the character in question, and as she speaks her words are overlaid on the screen, in increasingly bolder text as her words become more panicked. This scene above all others really stuck with me, and really made me feel the character’s helplessness and frustration at her situation. The soundtrack for ef – a tale of memories is just right; it is there in the background, and helps set the mood, but is not overbearing. What really stands out here is the fantastic OP, “euphoric field,” by Tenmon featuring ELISA, as well as a set of equally awesome EDs, “I’m here” by Hiroko Taguchi (aka “Adagio by Miyako Miyamura”), “Kizamu Kisetsu” (刻む季節 Carving Season?) by Junko Okada (aka “Vivace by Kei Shindo”), and “Sora no Yume” (空の夢 Sky’s Dream?) by Natsumi Yanase (aka “Andante by Chihiro Shindo”), and “Yūkyū no Tsubasa 07.mix” (悠久の翼 07.mix Eternal Feather 07.mix?) sung by Yumiko Nakajima (aka “Yūkyū no Tsubasa 07.mix / Euphoric Field live.mix”), which is actually a remixed version of the opening theme from the visual novel. As their names imply, each song sets the mood for a particular character, and they do so beautifully, using a variety of instruments and musical styles. My only complaint is with the opening song, “euphoric field,” they actually used two versions, one in Japanese and the other sung in “English,” used for most of the episodes. This version in particular sounds… strange. The translation is a bit “Engrishy” and the pronunciation is a bit off as well. But the actual melody of the song more than makes up for that. ef – a tale of memories has one of the better soundtracks I’ve heard in quite a while. ef – a tale of memories is an emotional roller coaster ride, and really explores the intricacies of human relationships. It asks the question “can we love someone for who they are, or just based on our perception of them?” Yes, it’s melodramatic and over the top, but it couldn’t effectively make its point otherwise. This anime has become one of my all-time favorites, and is definitely worth watching. Is it on a Key/Kanon/Clannad level of soul-wrenching emotion? Not quite. But I’d still have some tissues handy while watching. Unless you have the stoicism of, say, Mr. Spock, you’re gonna need them. Want to check it out? It’s available for sale on Amazon in both DVD and Blu-ray. It’s also streaming on Crunchyroll.